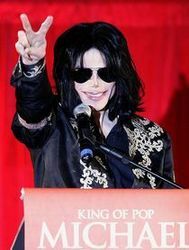 The world was recently saddened by the sudden loss of pop icon Michael Jackson. In memoriam of this legendary and one-of-a-kind performer, Ztarlet.com has dedicated an actual star in his memory - as a symbol of the bright light that Jackson brought to the music industry and his millions of loyal fans across the globe. Our service meets the demand for unique gifts that cross all generations and barriers, is perfect for any occasion, and provides lasting value. Honoring Jackson in this fashion ensures that his legacy is remembered for many years to come. A star is a symbol of eternity and as such, Ztarlet.com Star Registry has just announced that a beautiful star has been dedicated in memory of Michael Joseph Jackson, pop singer who is known the world over for his legendary 80s album "Thriller", which remains as the best-selling album of all time with over 100 million copies sold worldwide. Jackson first rose to fame during childhood as a member of the Jackson Five (1968). Recent plans for a 2009 "comeback" tour that was to be launched in Europe were brought to a sudden halt with his passing on June 25, 2009. Through this memorial dedication, it is thought that Michael Jackson's memory will live on through the ages. Naming a star after an individual is the perfect way to show honor and appreciation for the person and their achievements. Celebrities like Arnold Schwarzenegger, Tiger Woods, Oprah Winfrey, Cindy Crawford, and Britney Spears already have their names up in the sky through star registry services. There is no doubt that many more individuals have hopes of following in their footsteps by having a star named after them in their favorite constellation. It is said that "nothing is forever" - but naming a star after a loved one - spouse, child, parent, grandparent, or even a favorite celebrity lets them know how much they mean to you. According to CEO of Ztarlet.com, Gabriel Pap, registering a star in a loved one's name is the ultimate gift that literally lasts a lifetime. As Pap puts it, "Our service meets the demand for unique gifts that cross all generations and barriers, is perfect for any occasion, and provides lasting value. Honoring Jackson in this fashion ensures that his legacy is remembered for many years to come." Indeed, with the gift of a registered star, the recipient will truly live on long after they are parted from this earth. "To name a star is a unique expression that symbolizes eternity. It is a gift that will last forever. It is the belief of Ztarlet.com that it is only fitting that one of the century's biggest stars, Michael Jackson, should be immortalized in this manner - a timeless tribute to Jackson's astronomical achievements through his music and his charitable works," says Anthony Khamsei, marketing executive for Ztarlet.com. Through this memorial dedication, it is a certainty that Michael Jackson's memory will live on through the ages. For additional information about star registry services, kindly contact Gabriel Pap or visit http://www.ztarlet.com. Ztarlet.com offers individuals and companies via the Internet to purchase different packages of stars in the universe. By naming a star in the sky customers obtain a certificate that certifies the registration and reserves a unique star coordinate. Stars can be selected by the customer in an advanced star system that was built on the site and covering the areas of Orion, Ursa Major and the Ursa Minor. Visit the website to determine star occupation and availability. For each star that is registered on Ztarlet.com, 20% of the profits go to "A Non-Smoking Generation" - which is an organization that works to discourage smoking among Swedish youth.